Like many component manufacturers, you have identified lead generation as a way to increase your turnover. And you are absolutely right! Industrial buyers are increasingly connected and autonomous as regards their purchasing needs. Below are three ideas to help you improve your lead generation. To build an online presence that generates qualified leads, your website must appear on search engines. To optimize your presence on search engines, you must put in place an SEO strategy. Search Engine Optimization or natural referencing means placing your website and its pages among the top search engine results. As a component manufacturer, would you like Google, Bing or Qwant to actually help you generate qualified leads? To do this, you must create content that appeals to the search engines and which is also of direct interest to your customers and prospects. The more content you create with specific keywords aimed at your customers and prospects, the more the latter will visit your website. It is purely a matter of statistics. You have validated the first step. The number of visitors to your website has increased sharply. This is good news. Now, you must establish “conversion points” to convert your visitors into leads. Nothing could be simpler. You must encourage them to take action by putting CTA buttons (Call-to-Action) at their disposal. 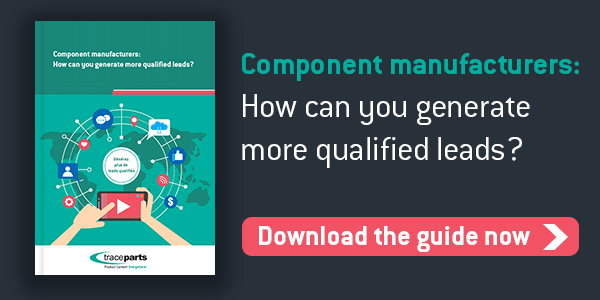 As a component manufacturer, you must complete just one more step to generate high-quality leads. You must ensure that once the CTA button is clicked, your visitors fill in the form by carefully designing the landing page on which it is located. Have you done that? Well done, you have generated a lead. Meeting the two previous prerequisites will generate leads. However, in industry, manufacturers often obtain leads that are not yet ready to make a purchase. You must distinguish between hot leads and cold leads. You can transmit the hot leads to your salespeople. As regards the others, it is crucial you give them food for thought, notably by sending them email campaigns. How to distinguish between hot leads and cold leads? You must first create a rating grid with all the criteria that characterize a qualified, mature lead. You can then determine a threshold point beyond which a lead can be considered “hot”. Bonus: Call on the services of a partner specialized in generating qualified leads! We help you generate qualified leads by providing digital marketing programs adapted to your needs and your budget. Would you like further information or to discuss your lead-generation strategy?